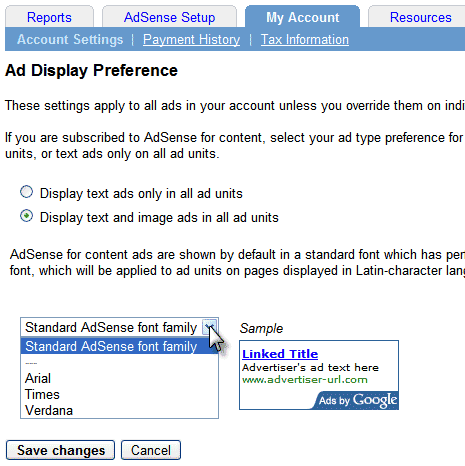 Google Adsense Ads (text) just got better which new feature of customizing font in ads. Now you can change the font face of the text in ad units on pages in Latin-character languages. You can choose between Arial, Times, and Verdana font faces. Please note that while font options will appear in every account, they will currently only be applied to ad units on pages primarily in Latin-based characters. Login to Adsense account and click on ‘My Account’ tab. By default, ads will have standard Adsense family font. You can select and customize font by selecting among: Arial, Times, Verdana. This change will apply to all ad units in your account unless you overirde specific ad units under manage ads tab. So besides, ad font color, background color – we have font type option to optimize Google Adsense ads further for better performance, like it? Good Content its really helpful, but who else wanna learn more about Adsense or etc.. go read more here (ebook-store.webs.com/Learn-Adsense-Secret.html)Learn Adsense Secret. I hope this will help you.